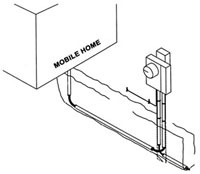 L&I requires a service disconnect to be located within 30 feet of the exterior wall of the mobile home. Referred to commonly as a mobile panel, it also serves as a meter base and a source of power for accessory buildings and well pumps. Mobile panels can be installed on a pressure treated pedestal or on the accessory building if it is within 30 feet of the home and meets our meter requirements. an L&I permit, inspection, and verification of L&I compliance.